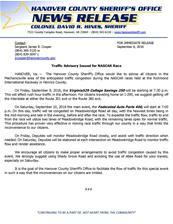 HANOVER, Va. – The Hanover County Sheriff’s Office would like to advise all citizens in the Mechanicsville area of the anticipated traffic congestion during the NASCAR races held at the Richmond International Raceway in Henrico County. On Friday, September 9, 2016, the Virginia529 College Savings 250 will be starting at 7:30 p.m. This will affect rush hour traffic in the afternoon. For citizens traveling home on I-295, we suggest getting off the interstate at either the Route 301 exit or the Route 360 exit. On Saturday, September 10, 2016 the main event, the Federated Auto Parts 400, will start at 7:00 p.m. On this day, traffic will be congested on Meadowbridge Road all day, with the heaviest times being in the mid-morning and late in the evening, before and after the race. To expedite the traffic flow, traffic to and from the race will utilize two lanes of Meadowbridge Road, with the remaining lanes open for normal traffic. This procedure has proven very effective in moving race traffic through our county in a way that limits the inconvenience to our citizens. On Friday, Deputies will monitor Meadowbridge Road closely, and assist with traffic direction when needed. On Saturday, Deputies will be stationed at each intersection on Meadowbridge Road to monitor traffic flow and render assistance. We encourage all citizens to make proper arrangements to avoid traffic congestion caused by this event. We strongly suggest using Shady Grove Road and avoiding the use of Atlee Road for your travels, especially on Saturday. It is the goal of the Hanover County Sheriff’s Office to facilitate the flow of traffic for this special event in such a way that the inconveniences on our citizens are limited. National Night Out: A Great Success! Second Fall Fellowship Festival a Great Success! 2016 HCSO National Night Out: A Great Success! National Night Out A Huge Success! National Night Out 2015 is Here! How do I file a police report? How old must I be to be hired as a sworn officer?